i saw Ozzie also lashed out at Loria, saying that if Loria wants to fire him he should look in the mirror and ask himself why so many f'n managers come through here. The Marlins are a better reality show than ballclub. Oh man it feels so good to be right about the Marlins. How some people didn't see the impending disaster in putting all of those personalities together is a mystery to me. bobby v should be on the market in about 2 weeks. Well... take a look at all the talent they had. Five players to build around in the lineup. Sanchez - solid mid-rotation starter... always good for a mid 3's ERA. Bell - stud with SD... no way to know his hit rate would go from 7.8/9 to 10.3/9 as he's been this year. Dunn - tough lefty... who held LHB to .198 AVG in 2011. Nunez (whatever his real name is) - after suspension... he'd give the fish another big pen arm. You can say the personalities would never work (and in the end, they didn't).... but there certainly was enough talent on paper for people to be very scared of the 2012 Marlins. So, to say it was always a slam dunk, Knorr... I think that's a bit of an over simplification of the situation. Not to mention they were a half game behind us for first place after they swept us in late May. Hanley and Morrison are clubhouse problems (which was my initial point), Reyes and JJ are injury prone, and both Sanchez's are overrated. Buehrle was on a bit of a decline before coming to Miami, and ask Barry Zito about that whole AL to NL thing. Not to mention their manager is a complete psycho. I'll give you the bullpen, but the Marlins were just a ticking time bomb with way too many things that could go wrong. I just don't get how people were so enamored with the talent on paper that they didn't really pay attention to all of the issues with that team. Medlen takes on the hapless Fish at home in Atlanta tonight. Nate Eovaldi opposes him, he pitched 8 scoreless IP against the Braves in his last start but you can bet they will be all over him tonight. 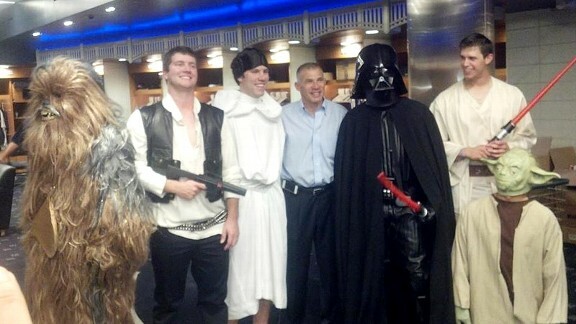 Yankees rookies dress up as Star Wars characters. Apparently the Angels are going to decline options on Haren and Santana and pursue Greinke. that makes a lot of sense. You can't justify spending nearly $30 million to keep Haren and Santana. Watch at least one of them end up in NYC. Would love Haren on the Nats. He's been hurt most of the year so when he shows up healthy next year for a team, they'll have gotten a steal. what would you pay for him though? He's 32, probably looking for a 3 year deal around $15 million? Definitely would go for that. Lannan and Jackson would be gone... That's 17 million right there. 3/15 for Dan Haren? Oh yes. I'd do 2/15 even. Haren will get a lot more than $5 Million a year. He was suggesting $15 mil per. And that's too much. Pass. p.s. yanks are pwning the twins right now. I'm sure that ruins your day.